The Yellow "pin" signifies where this site is within the forest. Click on Purple dots above to visit other sites in this forest. 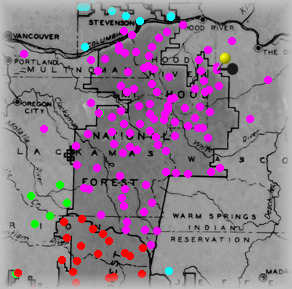 Click on other colors for sites in adjacent forests. Visit a USGS topo map for this site. You must be web connected for this to work. Click on the nearest neighboring site name or its forest. Click on one of the images below to see a larger view of that image. Data on this page is NOT warranted, expressed or implied, to be accurate.